This is an original artwork painted by myself with acrylics and oil pastels on canvas. It is a commissioned piece that will be given as a wedding gift to Nancy and Eddy. It portrays the world through the eyes of people that are “In Love”. Do you like this and know someone that would appreciate a similar piece? All my paintings are copyrighted and cannot be duplicated without written permission from the artist. **This painting was not stenciled or created from a pattern. It is hand drawn and colored. Note: Color may vary due to monitor color settings. 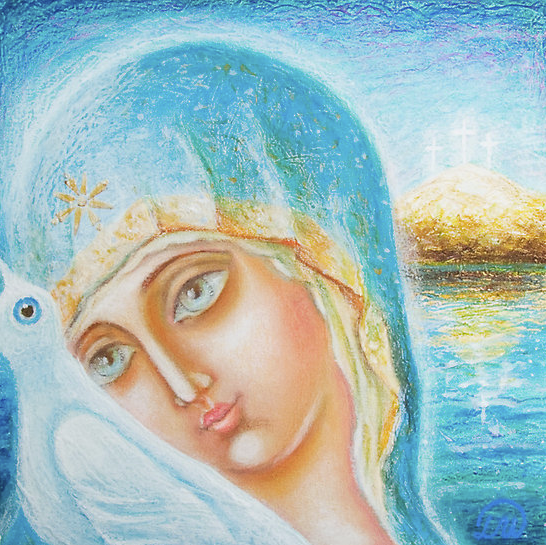 Many of my works can be obtained as prints, needlepoint canvases and more on Ebay. Click here to view those items on Ebay. If you don’t see a work that you would like please let me know so we can take care of you. © All of my paintings are protected by international copyright laws and cannot be duplicated without written permission from the artist. If you have an interest in obtaining a commercial license please contact me for details. See this piece on Red Bubble to view all reviews on this painting given by other artists! You also will be able to view this work in a larger format! This is an original 12″x12″ art piece was painted by myself with acrylics and oil pastels on canvas. This painting is sealed with protective matte coating. Thank you for considering my art and please come back in the future to see what’s new. Recently some of my art work was featured on RedBubble and I wanted to share them with you. They have featured my folk art a number of times before but some people have asked me to post the featured work on my blog so here is a screen shot of the work. You also will be able to view this work in a large format! I created this fun folk art ACEO, “Worm For Dinner” that features a whimsical rooster that finds a worm and is about to eat dinner. Original folk art done on a 2.5×3.5 ACEO with metallic acrylic paint and archival ink. 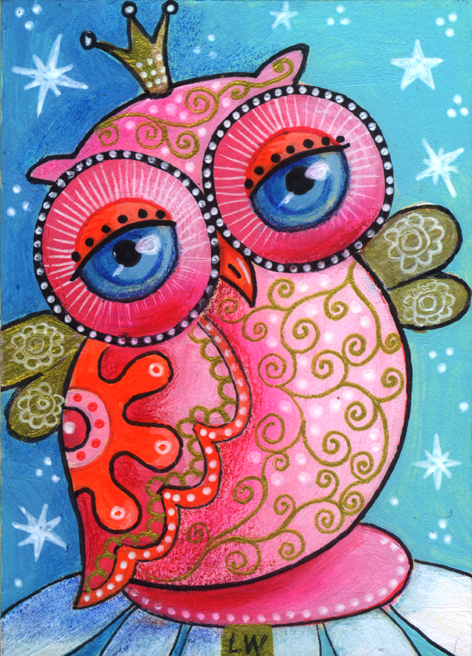 I created this folk art ACEO, “Princess Owl” because I wanted to do something different. Pink Owls are very rare, endangered list for sure. Original folk art done on a 2.5×3.5 ACEO with acrylic paint and archival ink. In the first article I wrote about using the Red Bubble Art website I covered the value of using it as an artist that wants to reach the ever expanding online community. I am also a stay home mom that home schools my children so I want to use the Internet as much as possible to show my art work. 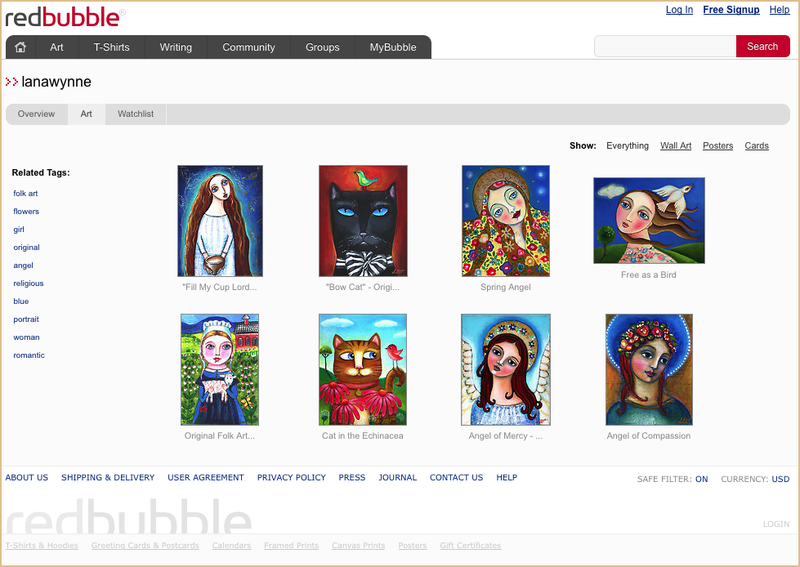 In this article I wanted to cover the process of adding your artwork to the Red Bubble Art website. First you will need to login to your RedBubble account and if your Internet browser asks if you want it to remember your account information including your password, I would do it unless you are on a public computer. Recently a large number of WordPress blogs were hacked on GoDaddy and other hosting company’s servers so I don’t have passwords that are easy to remember any more and I would recommend anyone do that after going through the frustration of being hacked. After you have logged into your account you will want to click the large ‘Add Your Work’ text located in the upper right corner of the screen. 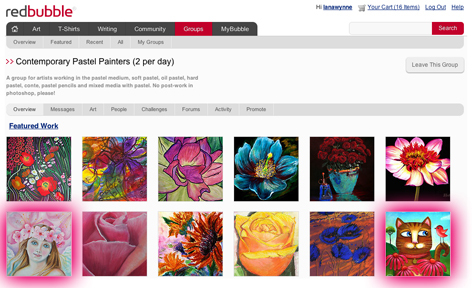 Once you clicked that the menu will drop down and you will want to choose the category that you are listing your art in. In my case I will be using ‘Art & Photography’. The next page that you see has a large red button that says. “Choose Your File”. Once you click this you will want to navigate to the art piece that you want to display on Red Bubble. Once you have chosen your file it may take awhile depending on the size of the file but now is the time to add the remaining information into the listing. Add your Title, Description and Tags. Remember that you should use keywords or long tail phrases that are good for SEO (search engine optimization) or at least that what my husband tells me. Actually he did give me a video about using some tools to help me in my website development and he does do some of the work for me, lucky me. Once that is done you will want to choose what kind of Products for Sale you want to make your art work available as. If your file will not be appropriate for some of the choices the Red Bubble will determine that automatically for you. It is important if you want to use all the choices that you get a good scan of you work at a high resolution or get good digital photos and it would not be inappropriate to even bring your pieces to a photo studio for professional pictures at a high resolution. This will insure that you will be able to sell prints of your work for years to come unless you are going to have limited edition prints. After choosing the items that you want to sell you will want to determine your pricing and you will see a text box that has a percentage in it with text to the left side that says ‘Your Markup’. You can adjust the markup and then click on the link to the right that says ‘Example prices’. You will see the base price that will go to Red Bubble and then you see your markup percentage and your profit margin and to the right column the retail price that will show on your website for your customers. Once you are done you will be able to click on the red button in the lower right corner entitled “Done & Done – Add My Work” You will then be able to see the store view. If you make any mistakes you will be able to edit your work by clicking on My Bubble, going to Art in the sub-menu and then click edit on the art piece that you want to revise. Copyright © 2019 LanaWynne.com, All Rights Reserved.